New to the world of plantation shutters and want to know a little more? You’ve come to the right place. Shutterly Fabulous are experts in our field, designing, measuring and fitting shutters to any size and shape window or door, known for bringing lasting style to homes across the UK. In this guide, we’ll share all you need to know about plantation shutters, their benefits, the different types of plantation shutters on offer, and how to order them. Plantation shutters are wooden, slatted blinds that sit inside their own frame, drilled to your window sill or door frame. The slats – or sometimes referred to as louvres – can be tilted from fully closed to fully open, and angled anywhere in between, allowing you to control light and airflow through the room. Where do plantation shutters come from? Plantation shutters get their name from Southern USA, where shutters became commonly fitted to mansions on cotton and sugar plantations. Their actual origins can be dated back to Ancient Greece and Medieval times where solid shutters made from materials like wood and marble were fitted to buildings for the protection they offered from weather and security. Plantation shutters are one of the most flexible window dressings on the market, and have the edge over curtains and blinds for many reasons. They are known to help improve sleep. By completely closing the slats, shutters minimise light pollution in the room, offering you undisturbed sleep through the day and night, making them a popular choice for nurseries and bedrooms. They offer privacy without compromising light. 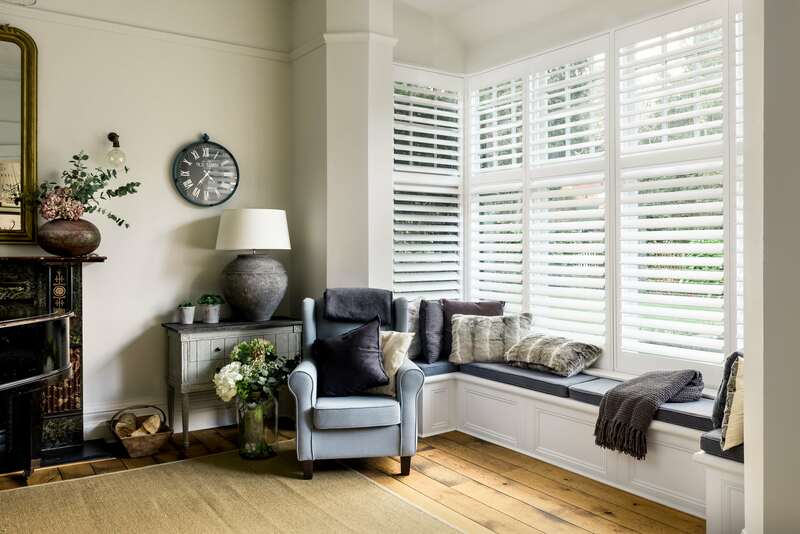 Unlike curtains or roman blinds that you must completely draw back to allow light through and stripping the room of its privacy, shutters give the best of both worlds. By simply tilting the slats, shutters keeps passers by from peering in and still allow light to flood the room. They have been known to retain heat in a room. Closing your shutters can minimise draughts in windows and doors making them an ideal option for single glazing. They reduce noise pollution when closed, dulling the sound of traffic and hustle and bustle, making them a great choice for city dwellers. They allow ventilation without compromising on privacy or security. On hotter days, windows and slats can be kept open, allowing air to ventilate the room while retaining privacy and security for pets and young children. They increase the value of property. Homes that have plantation shutters give the impression of a well-maintained property, thus increasing interest in potential buyers. They look visually elegant and compliment all era buildings. Plantation shutters suit all properties from Victorian, Edwardian and Georgian homes, to 1930s, 50s, 60s and all the way up to new builds. What are plantation shutters made of? We offer four different types of plantation shutters to suit every room and budget. All expertly designed with your requirements in mind. Affordable Basswood – Widely available, Basswood is the most economical timber we offer. It’s very durable, characterised by a tight grain that provides a smooth finish when painted. For standard shaped windows, basswood is a great choice and look timeless when painted classic whites, greys and neutrals. Classic Poplar Wood – Poplar wood is a fast-growing wood with a smooth, even grain. It’s strong, beautiful and lightweight, making it the right timber for shutters hanging across large windows and doorways. Any custom shape window can be made from our Classic Poplar Wood range, and we have a choice from a range of paints and stains for the perfect look. Premium Elm Wood – The naturally deep grain of Elm wood brings a sophisticated natural wood effect to a room, best accentuated when applied with one of our rich stained finishes that we offer in a variety of tones. Our Premium Elm Wood range provides a truly elegant look that can be made to measure on any sized door or window. Waterproof Polyvinyl – Perfect for kitchen and bathroom windows that sit close to a water source, our Polyvinyl range is waterproof and impervious to all moisture. Hardwearing and durable, these shutters are also a great choice for high traffic areas such as playrooms and commercial environments. What styles do plantation shutters come in? There are three core styles to be aware of when selecting plantation shutters for specific light and/or privacy needs. Full height plantation shutters cover the whole window offering clean lines, and a simple style. In many cases, full height shutters can be fitted with a mid-rail to increase its versatility and benefits, such as splitting the way slats function. Tier-on-tier plantation shutters are the most versatile of the styles. They are installed with an upper panel, and a lower panel that can be opened and closed separately to one another. For example, the top set of shutters can be left open while the bottom set can be shut. Commonly seen on bay windows but available on all window styles, this is a great option for windows where a good level of privacy and light control is needed throughout the day. Cafe-style plantation shutters are fitted only to the lower part of the window. The benefit of these are that they offer light to penetrate through the top window at all times of day, yet keep the room private at the lower half, great for when you are seated at a table for example. Solid shutters are the ultimate in snug interiors. They offer solid panels in their design, achieving complete privacy when closed. They act as an extra barrier against noise and weather providing the ultimate in cosy, secure home comfort. Do plantation shutters come in other colours? Absolutely, yes. Plantation shutters are available in any colour or a variety of stains. We offer a wide variety of timeless shades and stains at no extra cost or we can colour match shutters in any shade from the Farrow & Ball or Dulux Trade colour palette for an extra 10% on the cost. Coloured shutters are a great feature in a room, while our Silk White, Dove or Alabaster shutters offer enduring style. How do I order plantation shutters? If you’re interested in getting plantation shutters installed in your home, it couldn’t be more simple. Download our brochure for more examples of shutters in customer homes, then give the team a call on 0800 9700 800 or request an appointment online. We’ll send one of our experienced consultants to visit you, discuss your design and shutter options and take measurements for your window. You’ll receive a quote usually within 24 hours of your consultant visiting, and can finalise any changes before placing your order with us. Your shutters will be made bespoke for your room, in approximately 8-10 weeks from the date they were ordered. We’ll then book you in for a full fit as soon as they’re ready and you can sit back, relax and admire your new plantation shutters. Order yourself a brochure today, it’s a shutterly fabulous source of inspiration packed with images of homes we’ve fitted our collections in. Got a window that’s a little tricky and you’re not sure shutters will fit? Give us a call and we’ll chat through your project – 0800 9700 800. I’m trying to decide what kind of blinds to install in my bedroom. I didn’t know that plantation shutters could actually help you sleep! It makes sense that being able to make my room darker would ensure better sleep for me.